I agreed to read Braun's Cursed series after much arm pulling, name calling, and begging on her part. Just kidding. It took absolutely none of those things. I have read many of Braun's books and I think it was a little more of the opposite, to be honest. I was pulling her virtual arm (via email), calling her lots of names (ex. OMG you're fabulous), and begging (please send me more!!). 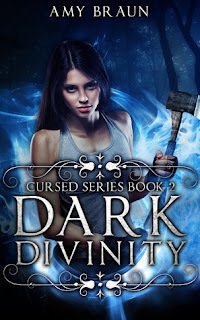 In Dark Divinity, the second installment of the Cursed Trilogy, the reader picks up right where book one ended. "Action packed" doesn't even begin to describe this novel. Dro, Connie, Sephiel, Max, and Warrick are thrown back into the heat of battle right from the beginning and the action doesn't stop until the very last page, where you will be left gasping for air and begging for more. The characters in the second book are much more developed. You learn about Dro and Connie's past with the blood thorn's and about Connie's past with Mateo. Dro and Max's relationship continues to grow, and we finally get to see what Warrick and Connie may have to offer one another. Sephiel is a robust character that I became incredibly attached to throughout the novel, loving him more and more with each swipe of a page. His honesty, bravery and devotion to the group made me enjoy and value his presence. I found myself constantly counting on him to get the group out of every sticky situation even when the future looked grim. In Dark Divinity, Braun creates a magical world with magnificently beautiful and terrifying characters. The reader is easily able to use their own imagination and can be instantly transported into the world of angels and demons. Once again, another stunner from Amy Braun!